Ran in the Provo Canyon. Speed work. Warmed up, then 5x400 alternating up and down with 200 recovery. Headwind when going down as usual this time of day (late morning). 71.3 down - 77.3 up - 73.3 down - 75.2 up - 72.3 down. That shows a solid headwind. Still air difference between up and down should be 5 seconds. This did not come as a surprise. I noticed during the warm up that I was running 7:12 pace downhill and the HR of 127. Usually it is around 6:50 with the same effort and HR over there. Jogged up to Nunn's park and ran the standard 3 mile tempo down. Mile splits - 5:24 - 5:24 - 5:21, 16:09. HR gradually made its way to 162-164. I kicked the last 100 meters, it went up to 169. Solid headwind virtually with no breaks. Not a single quarter faster than 1:20 except the last one (1:18). However, not a single quarter over 1:21 either possibly with the exception of the first (there is no mark there, but it actually uphill for the first 0.15). Jogged back to the place where I did the 400s earlier and repeated 5x400. 72.9 down - 76.4 up - 73.9 down - 75.9 up - 67.5 down. The last one shows that I am lacking anaerobic ability. When I have it in full force, I am only able to speed up by 2 seconds on the last one. I could also tell I was losing steam after the first 200. Then cooled down to the car. It started to get warm, and I could tell I was dehydrating a bit. HR went up to 138 at about 7:20 pace uphill. Normally it should have been around 128. Total of 14.8 for the workout. Easy run with Ted at 4:50 AM. 10.05 miles at 7:44 pace, average HR 113, new record. On the first quarter which we did in 2:18 it did not crack 100 - only 98, but the pace felt fast. I take it as an indicator of aerobic fitness gain, if 9:00 pace feels fast in the first few minutes of the run while the heart rate is low. The engine is taking its time to warm up, the stronger the engine, the longer it needs. Added another 3.5 in the afternoon running with the kids and some more. Tempo run this morning. Got decent sleep, went to bed at 11, got up at 6. It was cold, around 35 degrees, but warmer than last winter. No significant wind. Ran the standard 5 mile tempo from Geneva Road to the trail entrance by the Utah Lake Park and back. First mile, 5:32. Second 5:31 (11:03), then 2:47 for the next 0.5, 13:50 at the turnaround. The pace felt very comfortable, however I knew that any faster would be exceptionally uncomfortable. HR took forever to get going, but finally stabilized at 158 by 1.5 miles. 2:50 for the next 0.5 with the first quarter after 180 turn in 1:26. The first 100 of it was 23 seconds, so 2 second loss. 5:37 for the mile, 16:40 at 3. Next mile in 5:35. HR climbed to 160, and now the pace is starting to feel harder, although it is still the same pace, even a bit slower, but coming back is a very slight uphill, so 3 seconds per mile is about the correct amount of difference. The breathing became harder too. The sour feeling in the quad appeared but I was able to run through it this time. Quarters for the last mile - 1:25 (uphill), 1:24, 1:23, 1:20. HR maxed out at 169 at the end. Total time 27:47.8, best time for the season. Last mile in 5:32, last 2.5 in 13:57, I would call this a true even split, perhaps even negative if you throw in the 2 seconds lost on the 180 turn. Did a long cool down, total of 13.1 for the run. Ted did the easy running with me, he was planning on joining me for the tempo, but got sick. Ran with the kids in the afternoon, total of 14.9. 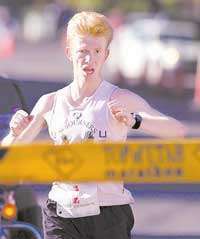 I am running the Salt Lake Half, not the full marathon. Will do it completely untapered. It is fun to race a half at the end of a 90 mile week, I've done this before. You hurt from the start, as opposed to from mile 3, so you actually get better pacing. I was very happy with this tempo, most particularly about being able to hold the pace as the quads start feeling sour. I am perplexed as to why HR takes so long to get going in a tempo run. It took a good 4 mile stretch before it got to where it was supposed to be. My average HR for the run was actually 153! This has been a pattern regardless of the weather. So here is what I am wondering about. If I am running 5:32 pace, and the HR eventually stabilizes at 162 then if it is let's say 153, and assuming I do not severely dehydrate in 4 miles of tempo running in 35 degrees (reasonable assumption), and the stroke volume does not drop as the tempo run progresses (reasonable assumption? ), and the biomechanical efficiency does not change that much (reasonable assumption? ), then at 153 HR my cardiac output is significantly lower than what is necessary for a steady state that happens at 162. But the energy for the pace has to come from somewhere, so that in essence means I am running anaerobically for the first 4 miles of this run. Could it be that HR response to lactic acid build up, and unless you have a certain lactic acid concentration, it will not increase? Easy run with Ted in the morning. A little faster today, supersonic speeds compared to Wednesday, 7:18 pace. Ran with the kids in the afternoon, and a little more in Salt Lake to the expo and back. I will probably have 74 miles on the odometer for the week when I start the half-marathon tomorrow. Added a mile with Sarah late at night. A very long day. It started with racing the Salt Lake Half-Marathon. Ran it in 1:13:25. Got beat by Mbarak Hussein (1:05:17), Simon Sawe(1:05:33), and BJ Christensen (1:10:59). Not quite sure what to think of it. I am inclined to believe this is a better performance than two weeks ago in Ogden. I held by heart rate in the higher ranges for longer, although it still was not what I wanted it to be. Went out with the leaders from the gun. The marathon and the half started at the same time. At first it was more like the jail break in the Russian movie Gentlemen of Fortune. The police put in an infiltrator and organize a break for the three inmates of interest. The fourth one joins them. They ask him why he ran. He answers: "Everybody ran, so I did run too". Then I began to think about the reasons to continue to run fast. Enjoy the company of great runners while I can. Some TV time for the Wasatch Running Center. So I figured I'd hang in there for a while. We did the first mile in 5:03, probably 1-2 % down. I was in a pack with Mbarak Hussein, Simon Sawe, BJ Christensen, and Dave Danley who was running the marathon. I told Dave we were going 5:00 pace several times, but he kept going. We backed off a bit from the Kenyans and BJ. Second mile in 5:23, some down and some up. Next mile uphill in 5:47. My heart rate was hovering around 164, and I felt the pace was very aggressive. But I wanted to push it for as long as we were with the marathoners to make things a bit nicer for Steve Ashbaker. The more people are out front, the faster the marathon lead pack will go. And the faster it goes, the more casualties for him to devours in the last miles. I knew I could relax for a mile, clean up the lactic acid, and then pick it back up and still run a decent, even if less than perfect race. Pushed hard on the downhill down 21st south, hit the mile in 5:05. After that, we split from the marathoners and the mile markers were fuzzy. I had an idea of how fast I was going from the Garmin. But I was not so much concerned about the pace reading as I was about the heart rate reading. Garmin may be off on the length of splits, and there could be subtle factors such as a slight grade or slight but steady head or tail wind. But I know that if I can sustain my heart rate above 160, I'll be running well. I went in spurts. Sometimes I would get into good rhythm, Garmin would start giving consistent splits of 1:22 per quarter, and HR would be at 161. Other times, I would see it drop to 157 and the splits go down to slower than 1:25. Interestingly enough, running at HR of 161 was a lot more pleasant than at 157. This observation, as well as a number of others in training led me to formulate a theory that Steve Ashbaker suggested I post in the blog. When running 15 K - half marathon type of race, what we would call anaerobic threshold pace, the traditional exercise physiology states that you reach a steady state when you are breaking down lactic acid at the same rate you are producing it. But I suspect in reality things are a lot more complicated. The lactic acid levels are in a state of constant flux. They go up and down. When they go up, two things can happen. If the muscles and the nervous system are not conditioned for the lactic acid tolerance, they will shut down before the heart and the lungs can respond by delivering extra oxygen to clean up the lactic acid. If the muscles and the nervous system are properly conditioned, though, the muscles will work through it for a while, and in time the heart and the lungs will start working at a higher capacity making the faster pace sustainable. This explains why doing brutally fast 400s with 200 meter recovery on top of regular aerobic training make a difference of 10-15 seconds per mile in my half-marathon pace, and 5-7 seconds per mile in my marathon pace. The 200 recovery is a great form of aerobic training - you learn to clean up anaerobic byproducts very well. I got to 10 miles in 53:30. Kept on going, ran the last 5 K in 17:55. They were a couple of guys from Westminister college on my tail. I knew they were somewhere there and could be dangerously close. So I pressed hard enough to make them not want to catch me. Ate a banana, and ran back to find Steve. Followed the course and got to the start of the 5K. Figured I needed to seriously refuel to be prepared for the pacing job. Was very pleased to see Hobie Call in second place. He was two minutes behind Lemo, and pressing hard. Hobbie ended up finishing second, and missed the qualifier again by a minute. I think he can get it at Grandma's. Then there was another Kenyan, then Nick McCoombs, Dave Danley, Steve Tanui, and now here comes our Steve. A little later than I expected him, but very strong. I drank 4 cups of Gatorade to have the energy for pacing him, and I needed every ounce of it. He was going faster than me in the half. He got my HR to 161, and it hurt. A grimace started showing on my face. We flew past Steve Tanui. Steve (Ashbaker) was very excited about passing a Kenyan. He has never had the experience. He asked me if the Kenyan was just messing around. I told him no, he is just done. Now he needed to pass just one more guy to be in the money. Dave Danley was the next victim. I know the feeling, I've been on both sides of the deal. For some reason, I like to compare it to Abraham finding a ram in the thicket to offer a sacrifice. All of a sudden, there comes a dead runner out of nowhere, and you know he will not fight you. You also know you are in the money once you pass him. You begin to rejoice. I also know what it feels like to be the ram. Steve had about a mile left. I told him since he was in the money, he should now do it by himself to avoid possible, although very unlikely complaints about receiving assistance from a pacer. I slowed down and ran with Dave to the end. Congratulations to Steve on a new PR (2:36:31), great last 5 K (17:45), and 5th place in a tough company. Ran with the kids in the afternoon. Also for our date Sarah and I did her long run, which was 6 miles. So that gave me 29 miles for the day, and 101 miles for the week.